Lush Fab Glam Inspired Lifestyle For The Modern Woman: What Not To Wear: Celebrity Fashion Faux Pas. What Not To Wear: Celebrity Fashion Faux Pas. While promoting her 777 tour the usually fashion forward songstress Rihanna had back to back misses in a baggy faux leather pant suit with matching head wrap and an Acne menswear collection striped pantsuit paired with an oversize jacket by Raf Simmons. Actress Jessica Biel also had a double faux pas this week, in an unflattering Gucci gown with wings/side flaps and a much too old for her age Oscar de la Renta shimmering pant suit. Actress Naomi Watts was also keen on the wings for sleeve look in this black dress with the oversize sleeves hemmed to the sides. The always outrageous Nicki Minaj went for a more sophisticated look but failed miserably in this bubble gum pink pant suit, paired with contrasting shades of pink shoes, lips and hair wig. Actress Scarlett Johannson also missed the mark in this ill-fitting green and black peplum dress by Rodarte with dark wine red lips. 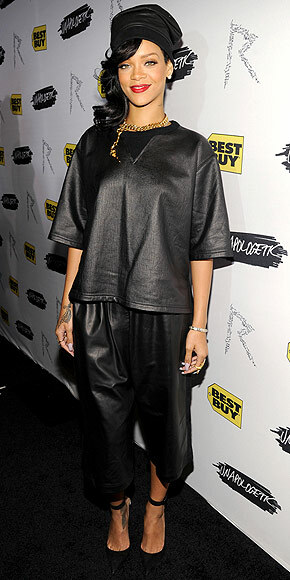 What do you think of these celebrity styles and who gets you vote for worst dressed celebrity? Leave a comment below.